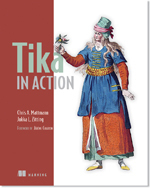 Note that you need Java 5 or higher to build Tika. Tika core library. Contains the core interfaces and classes of Tika, but none of the parser implementations. Depends only on Java 5. Tika application. Combines the above libraries and all the external parser libraries into a single runnable jar with a GUI and a command line interface. Tika bundle. An OSGi bundle that includes everything you need to use all Tika functionality in an OSGi environment. Note that adding this dependency will introduce a number of transitive dependencies to your project, including one on tika-core. You need to make sure that these dependencies won't conflict with your existing project dependencies. The listing below shows all the compile-scope dependencies of tika-parsers in the Tika 0.7 release. Unless you use a dependency manager tool like Apache Ivy, to use Tika in you application you can include the Tika jar files and the dependencies individually. An easy way to gather all these libraries is to run "mvn dependency:copy-dependencies" in the tika-parsers source directory. This will copy all Tika dependencies to the target/dependencies directory. Alternatively you can simply drop the entire tika-app jar to your classpath to get all of the above dependencies in a single archive. The Tika application jar (tika-app-0.7.jar) can be used as a command line utility for extracting text content and metadata from all sorts of files. This runnable jar contains all the dependencies it needs, so you don't need to worry about classpath settings to run it. extract text content and metadata from the files.